This delicious, low-calorie fruit dessert is easy and quickly to make and it’s a wonderful treat for your family and friends. 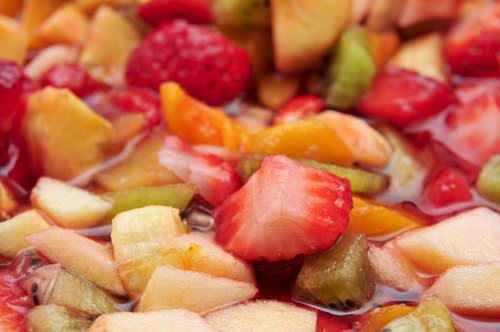 Mix diced strawberry, kiwi, and apples with 2 tablespoons of apple jelly and a tablespoon of orange juice. To make cinnamon chips, start with cutting up flour tortillas into triangles, paint each with a mixture of sugar, melted butter and cinnamon, and bake for 10 minutes.